Our Abpromise guarantee covers the use of ab119948 in the following tested applications. Defects in FGG are a cause of thrombophilia. Defects in FGG are a cause of congenital afibrinogenemia (CAFBN) [MIM:202400]. It is a rare autosomal recessive disorder characterized by complete absence of detectable fibrinogen. Sulfation of C-terminal tyrosines increases affinity for thrombin. 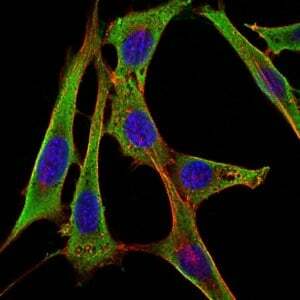 Immunofluorescence analysis of NIH3T3 cells using ab119948 at a dilution of 1/200 (green). Blue: DRAQ5 fluorescent DNA dye. Red: Actin filaments have been labeled with Alexa Fluor-555 phalloidin. 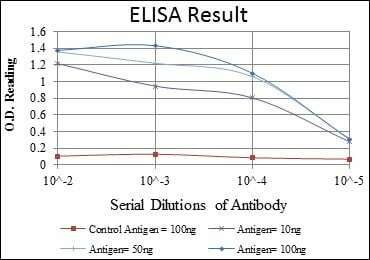 ELISA, using ab119948 at a dilution of 1/10000. Publishing research using ab119948? Please let us know so that we can cite the reference in this datasheet.